It’s been quite some time since we’ve been behind the wheel and it was readily apparent by our speed. Those vehicles on the motorway sure go fast! For the first 30 minutes everyone was passing us! We’ve vacated Waiouru in order that the marina can give her the final coats of varnish. Whilst it might have been a cheap ‘high’ staying aboard, every brain cell counts these days! We did the usual thing boaters do and hired a small sewing machine compact car from Enterprise. Their prices are competitive and the service is excellent. Rather than opt for the smallest category of vehicle and have a windscreen full of squashed eyeballs we paid the additional £2 per day for the next category of vehicle. 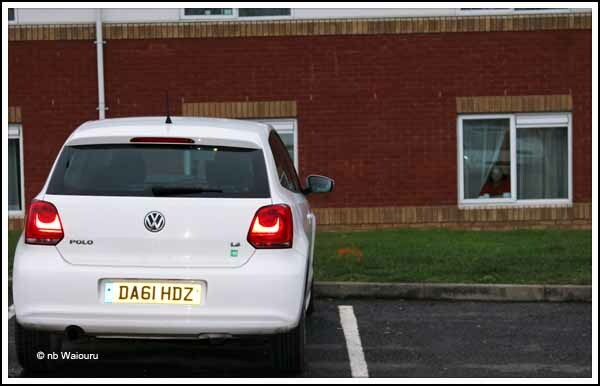 They have given us a two door VW Polo which is sufficient for our needs. Jan’s peering out the motel window! What do you do when you have a day to kill; little money; and want to stay away from canals. The plan was to travel to Foxes Outdoors in Amersham. 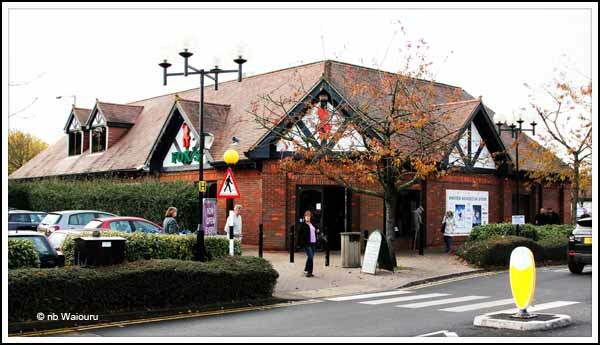 On each of our three previous holidays in the UK we have called in to Foxes to purchase outdoor clothing and footwear. They will provide on request the necessary documentation for the refunding of the 20% VAT on purchases to travellers leaving the UK. Whilst they may not be the cheapest; they have a wide range of products and the service is excellent. Today’s plan was to purchase replacement shoes for both of us. In the end Jan purchased a pair of walking shoes and three pairs of walking socks. I decided my existing walking footwear was sufficient. What I really needed was a pair of lightweight boots for use when travelling on Waiouru or walking the towpath. This didn’t require high quality £100+ footwear. 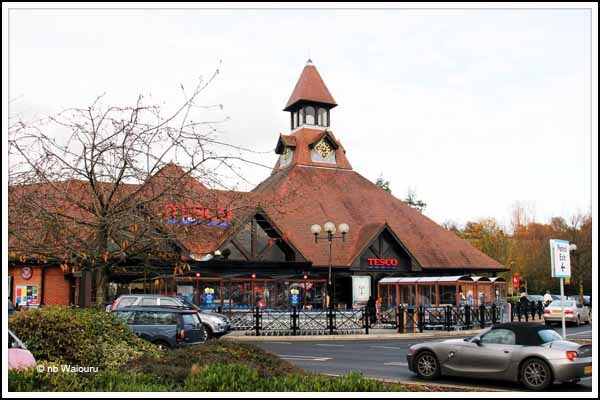 There is a large Tesco supermarket opposite Foxes and we had noticed on an earlier visit the attention taken to make it blend in with the surrounding buildings. Something unlikely to occur ‘down under’. Struggling to kill more time we drove towards Hemel Hempstead and (damn it all) started travelling beside the Grand Union Canal. Of course we started checking boats and potential mooring locations <grrrr>. Dragged ourselves away to a B&Q to check on small clotheslines and toolbags. However we resisted purchasing anything because we can use our seniors card tomorrow (Wednesday) and receive a 10% discount on all purchases. Still looking for some cheap boots we called into a large ‘Sports Direct’ store where I managed to purchase a pair of heavily discounted Karrimor boots (paid under £40) that should suffice. Prior to our last holiday in the UK we always booked B&B’s using the local Tourist Information service. This enables you to advance book accommodation in the desired area. But the restriction is…. only one night in advance. 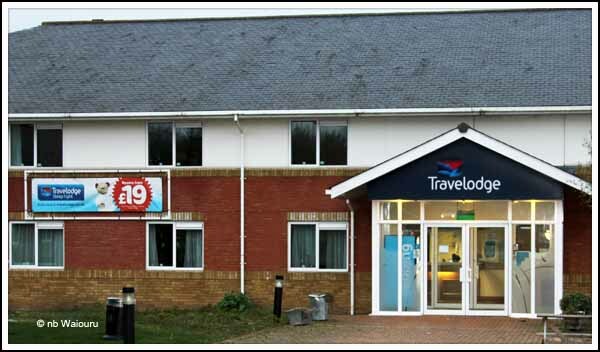 However we noticed the cost of B&B’s was steadily increasing and then stumbled upon the Travelodge budget motel chain. It is possible to book accommodation with them well in advance using the internet. Moreover we found we could plan our holiday itinerary around their discounted room rates and were able to book rooms between £19-25 per night for the two of us. Moreover the rooms were frequently larger than those we’d had in B&B’s. Breakfast isn’t included in the price but we haven’t found that to be an impediment. So we’ve killed a day and save quite a few of our diminishing brain cells. Our first night away from the boatyard and Waiouru in more than a year! Hope you have more luck than us with Travelodge. Our room at the New Forest was decidely spartan and uncomfortable. If you're looking for good quality or even excellent quality footwear it's always worth a look in a TK Maxx if you're anywhere near one. I recently bought a past season pair of Rohan walking boots that retail at around £120 plus for £30. It's definitely a shop that can provide a bargain if you're in the right place at the right time. We've not had a problem with one thus far. Not like the Australian motel where the bed bugs had a feast the night we were there! Yes...we've been into TKMaxx. It's where Jan purchased her winter boots at a very reasonable price! are you sure Jan is not running away from immigration officers? Jan is the one born in England and with a UK passport. Maybe they are trying to reach me! Hi Tom and Jan, Just came across your blog as a mate is interested in fitting out his own boat and your descriptions and pics are very detailed, so I will point him in your direction. Pleased to see that good progress is being made after the Ben Harp desecration. Also interesting is that you have a pic of me steering Nuneaton and Brighton on 24th July 2012. I remember wondering about your notice about Todd River NBC at the time. Thanks for the comment and the link to your blog. Can we place it on our blog list?